Stretching in the morning helps to increase the blood flow to your muscles. More blood in your muscles means more energy in the morning. Stretching also increases blood flow to your brain and sharpens your concentration in the morning. Below are some easy stretches to incorporate into your morning routine and help get your day started. On an inhale, reach your arms overhead, clasp your fingers together, flip your palms out toward the wall behind your head, and push your palms away from you. At the same time, reach your toes away from your arms, keeping your knees straight. Hold this fully stretched position for a few seconds, then exhale and release the stretch. Repeat 3 times total. Cross your right foot over your left knee, making the shape of the number 4. Slowly bend your left knee up toward the ceiling, either keeping the left foot on your mattress or hugging it in toward your chest. To increase the stretch use your hands to push your right knee away from you. Be sure to keep your right knee bent out to the right to maintain the shape while stretching. Hold for 3 times 30 seconds, then switch sides. Swing your feet over the side of the bed so that they touch the floor. 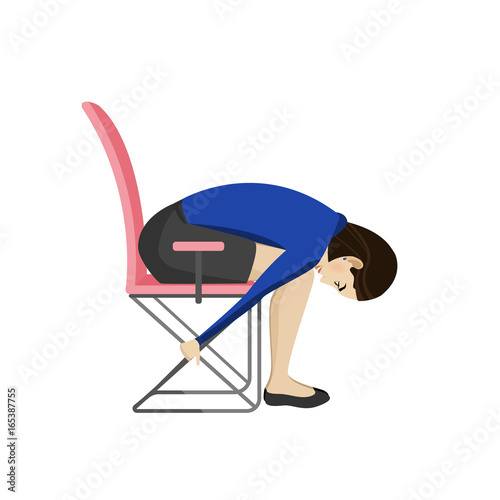 Keeping your knees bent, hang your head and arms down to the floor, rounding your back over your knees. Let your head and arms dangle to the floor; hold for 10 seconds, repeat 10 times. From a supine position (lying on your back), bend your knees until the soles of your feet are on the bed. Use your hands to draw one knee in toward your chest at a time, wrapping your arms around both shins, like a hug. Relax your head on your pillow and hold for 10 seconds, repeat 10 times. From Knees-to-Chest Stretch, release your grip of your shins and let your arms fall out to a “T” shape on either side of your torso. Use your core to guide your legs over to rest on one side, keeping your knees bent and shoulders planted down into your mattress. If it’s easy on your neck, gaze toward the opposite side. Hold for 10 deep breaths, then repeat on the other side. Begin by lifting your torso upright from a reclined position. Keeping your legs straight, inhale and lengthen through your spine; as you exhale, start to walk your fingertips toward your feet. Keep lengthening your spine with every inhalation and sink a bit deeper into this seated forward fold with your exhalation. When you get to your farthest point, let your neck hang heavy toward your legs, releasing any tension. After 10 rounds of breath, slowly lift your torso back up. Remember that all of these stretches should be completed in a comfortable, PAIN FREE, range of motion. Do not overextend yourself, you should just feel a gentle stretching sensation. If you have pain with any of these movements, stop and consult your physical therapist!